[AUTO]:[Soul Blast (1)] When this unit is returned to your hand from (RC), you may pay the cost. If you do, choose another of your «Bermuda Triangle», and that unit gets [Power]+4000 until end of turn. Bermudas needed a card like this for a long time! A solid 9,000 power second only to Lumiere and Aqua which are 10,000 vanillas, Celtic also has a skill that can help turn the tides depending on how and when you pull off. When Celtic is sent back to the hand, you can Soulblast 1 to give a Bermuda Triangle unit an extra 4,000 power! That is unbelievable as that can be enough to push for the extra 5,000 power to guard! The only kind of drawback that I can think of about this is how exactly to put this into your Bermuda Triangle deck? Granted, if you're playing a PR♥ISM deck, then that's actually easy as you make everything PR♥ISM for Labrador ( a card we will soon review), but in a non-PR♥ISM build, there are still cards like Pearl Sister, Perla, Girls' Rock, Rio and Top Idol Aqua for most players. That is all personal playstyle, but as for me, Celtic has definitely earned a spot in my deck! Next Time: I'm not in the Arctic...so where did this Aurora come from?! Celtic is representative of the new Bermuda Triangle bounce unit. Before, we had units like Girls Rock Rio and Rainbow Light Carine who drew cards when they bounced, but now is the age of PRISMs, break rides, and magic numbers becoming even more important. Celtic is a typical non-vanilla grade two with 9k power. When returned to the hand from the rear guard, you can soul blast one, and boost another Bermuda unit by 4k. This has a number of uses, besides being a free power boost, since you can usually just call Celtic right back to the rear guard. First, it can push a single unit’s power up over 10k, allowing it to threaten a typical vanguard, even if it was crossridden. Second, since you can apply the boost to your vanguard, you can make your 11k vanguard 15k; a magic number when facing a 10k opposing vanguard. Third, you can boost your new PRISM unit, Lumiere, to be able to attack at 16k unboosted, which is enough to force a 10k guard against an 11k vanguard. Celtic plays an integral part of the new break ride play, which bounces two cards from the field, applying an additional 4k to your vanguard, which, in addition to the 10k from the break ride, only applies more pressure and/ or ferrets out the perfect guards. 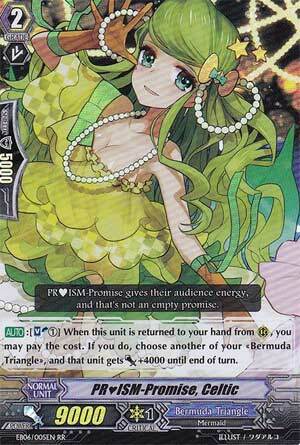 Plus, as a PRISM, she can go toward activating the limit break of Friday’s card. More on that later. Rating: 5/5 – PRISMs are going to be big.